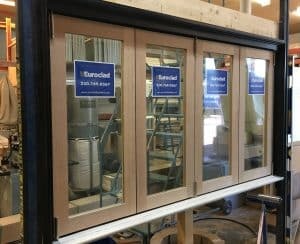 This beautiful server-folding window is custom built in our production facility at Euroclad Windows & Doors in Kelowna. Euroclad is proud to offer many custom variations; including (but not limited to!) the types of glass, the hardware, the frame, the number of folding panels and even the wood used to build the panels. 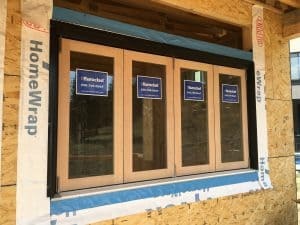 Not only are the actual server-folding window variations endless, but the install options and applications can make this piece even more unique. It can be installed in a kitchen flush with the countertop, installed inside the drywall so only the stacking portion is visible, used over a bar…the possibilities are endless. If you love the concept, have a look at our other variations including the Server-Awning Window. Contact us to request a quote for your own customized server-folding window, or simply to find out if this option will work for you! Available for new builds and renovations! The example featured in our demonstration shows a solid fir four panel server-folding window, in a black aluminum clad frame, with stainless steel multipoint locking hardware, and clear lowE glass. 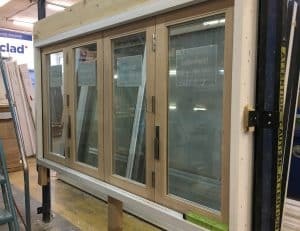 After the Server-Folding Window was built and tested in-house, this unit was delivered and installed on site by our professional installation team. It is used as a pass through from the kitchen to the exterior deck. If you are curious how it works, please click the YouTube link to view our in-house and on-site demonstrations! How Many Windows Does a House Need?